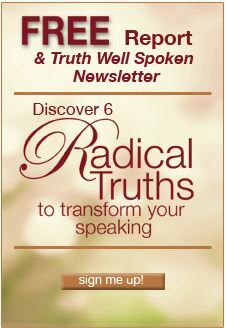 Before you enter your registration for the Immersion, please email gail [at] real speaking . com (CC: support [at] realspeaking.com as Gail is often off email during her travels)to confirm there is a space for the date you have chosen. Then you can complete your application. Once we have your application, we’ll hold your space in the order received until Gail has reviewed it. We’ll let you know if she has questions before you enter your enrollment. Gail would like to meet you personally by phone prior to the course. We want to assure the class is a good match for what you want to achieve so that we can fully support your intentions and goals. Once you have been accepted for a specific class, please register within 24 hours to assure your place. We do not hold your space without your deposit as the class size is limited to six. What about the wait list? You’ll note that classes are often filled months in advance. That leaves time for the unexpected to arise, and it is sometimes necessary for a participant to change their dates. So if you have your heart set on coming at a certain time when the program indicates “fully enrolled,” reach out and let us know! Do you want to get started today? 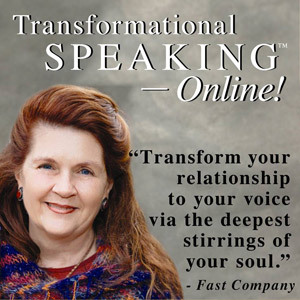 Join us for Transformational Speaking-Online! This substantive virtual training academy contains all the teachings and processes of the Immersion with Gail’s guidance on regularly-scheduled community calls. Business Terms: A gross receipts tax (currently 8.438%) is added for all services provided in New Mexico as required by law. All of your payments — including your initial deposit — are non-refundable. See Calendar for 2019 dates. Our application process and interview are in place to assure you we can meet our commitment to supporting your intention. Once you register, we require that you, too, show up with full commitment to your participation. When you register, we are committing one of only six spaces to you. Your tuition payments are not refundable should you cancel your participation. If you cancel because of an emergency and we are able to fill your spot, your tuition will be applied to another program within 12 months. If you cancel for personal or business convenience, you may re-enroll on a space available basis if a class is not fully enrolled two weeks in advance with a $500 rescheduling fee. Please understand that when we open enrollment for a class, we already have sufficient requests to fill a class. When we close enrollment, people typically move on to the next available date and it is time-consuming and sometimes impossible to replace you should you choose a different date. If we are able to accommodate your request for a change of dates, there is a rescheduling fee of $500. *With classes booked months in advance, clients sometimes find it necessary to reschedule and we go directly to the wait list. If you have your heart set on the Immersion and the date you want to come is fully enrolled, please complete your application and email gail [at] real speaking . com (CC: support [at] realspeaking.com as Gail is often off email during her travels) to wait list for an upcoming class or to be notified as additional classes are scheduled. Thank you! 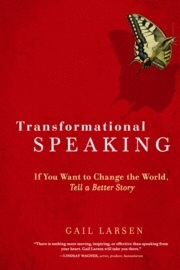 "If there are words in you that must be spoken, there’s no one more masterful than Gail Larsen. Entrust her to refine your brilliance and give voice to your life."